What’s the right amount of horsepower? After driving hundreds of different cars in my career, I’m very confident the answer isn’t “As much as humanely possible,” otherwise we’d all be driving around in Top Fuel dragsters, and that’d be a real nightmare during rush hour. And we’d be deaf. Very deaf. No, I’d argue the sweet spot is close to 400 horsepower, rather than 500, 600, or 700 ponies. A 500-mile drive from Charlotte, North Carolina to Daytona Beach, Florida for the Daytona 500 festivities in the 2017 Chevrolet Camaro ZL1 (followed by a 180-mile jaunt in a 2016 Ford Mustang GT Convertible) reaffirmed my position. The latest ZL1 comes to bat with a supercharged 6.2-liter LT4 V-8 that Chevy borrowed from the ZL1’s big brother, the Corvette Z06, and its snooty cousin, the Cadillac CTS-V. 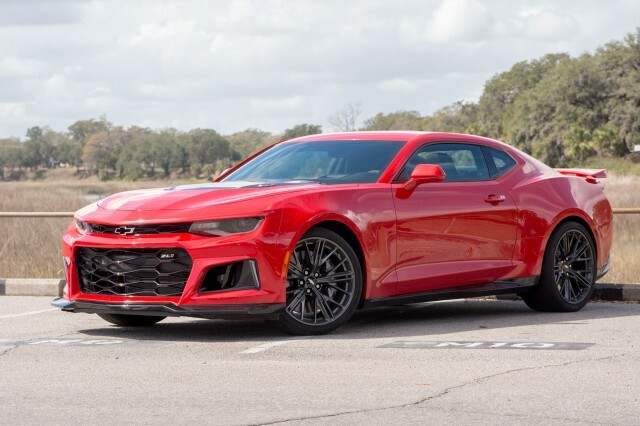 In the ZL1, the LT4 produces 650 horsepower, 650 pound-feet of torque, and will officially scoot the Camaro to 198 miles per hour. Unofficially, and with some help from Mother Nature, it’ll crack 200—both figures are wall-licking, padded-cell-level crazy, considering how few places in North America allow drivers to hit that kind of speed. Unsurprisingly, Chevy’s claims in other metrics are impressive, too. The ZL1 will hit 60 in just 3.5 seconds, a stat that 10 years ago was reserved for only the most potent Italian and German supercars, and the fastest of the Camaros will leave the factory capable of running the quarter mile in just 11.4 seconds at 127 mph. While Dodge uses 275-millimeter wide Pirelli P Zeros on the Challenger Hellcat’s back axle, Chevy took a much more dramatic approach, reaching out to Goodyear to design an Eagle F1 Supercar tire with a compound and construction specific to the ZL1. And just for good measure, these stickier tires are over a full inch wider than the 10.8-inch rears on the Hellcat. Paired with the Corvette Z06’s Performance Traction Management and a launch control system, the Camaro feels surefooted despite its ludicrous power. It’s still scary fast, but unlike a Hellcat, the power is easier to manage under wide-open throttle. Hit the gas pedal in the ZL1 and several things happen very suddenly—the Camaro squats on its rear haunches, the rear tires might squirm a little, and then you’re flying towards the horizon, accompanied by the bellow of the exhaust and the whine of the supercharger/passengers. While the public roads I drove the ZL1 on didn’t allow safe testing of Chevy’s 0-60 claim, several aggressive runs off the line left me thinking the we should take GM’s claims very seriously. But while the initial acceleration is relatively easy to manage, the Camaro’s impressive legs make it a handful in more relaxed driving conditions. For my 500-mile drive with the ZL1, I covered that distance in a single day which meant relying on interstate highways. To paraphrase Dr. Alan Grant in Jurassic Park, the ZL1 doesn’t want to do 70, it wants to go fast. Skipping the use of cruise control, which is blasphemy in a high-performance car anyway, I attempted to first keep the speed steady at 75 to 80 mph. This, I thought, was fast enough to satisfy the 6.2-liter’s appetite for road, but not so speedy that some home-spun southern sheriff would invite me to a road-side chat.